The Vision Festival has been touted by some as the new model for arts festivals in the wake of the demise of George Wein’s JVC Jazz Festival and other similar festival events. 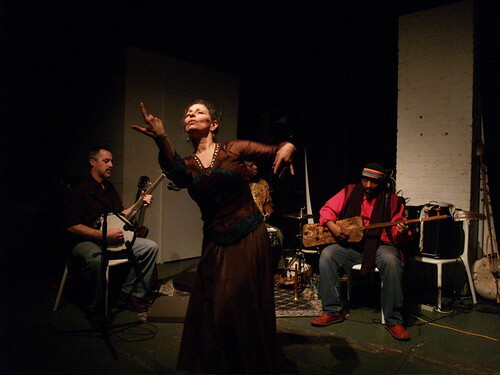 Organized by Arts For Art, a non-profit artists’ collective, the Vision Festival is very much by and for the Lower East Side community that has supported “avantjazz” for decades. The festival gives a very hip, antiestablishment vibe, and a vitality stemming from the passionate devotion of its musicians. I saw fellow trombonist Steve Swell play with cellist Daniel Levin and saxophonist Rob Brown — I’m not usually that attuned to avant-garde jazz, but I really, really dug this performance. Part of it was seeing a fellow trombonist doing all kinds of stretched-out awesomeness on the instrument. But it also had to do with the good vibes that I was getting from the panel discussion that preceded it. Some have suggested that the festival isn’t doing enough to foster younger musicians; this panel certainly aimed to focus on the younger generation. Tom Zlabinger, bassist, ethnomusicologist and director of York College’s jazz programs. Jessica Jones, pianist, saxophonist and music teacher at the Brooklyn Friends School. Daniel Levin, cellist and music teacher for Achievement First Charter Schools. Reggie Workman, bassist and professor of music at the New School. Ayana Workman, Reggie’s daughter and 10th grader at Elizabeth Irwin High School. Lewis Porter, pianist and director of the MA program in Jazz History and Research at Rutgers University. Bill Cole, musician, scholar and professor at Syracuse University. Full Disclosure/Shameless Plug: both Michael Heller and I are/have been students of Dr. Porter in the Jazz MA Program at Rutgers-Newark. This was the first time that I had engaged in thinking about music education since I left teaching in California last December. Although it has been nice to be away from the immediacy of dealing with kids every morning, the panel reminded me of the importance and the joys that come with it. Each of the musicians had a unique perspective based on their own experience, but they all showed the possibilities that exist in negotiating the challenges inherent in working within a school environment. I came away refreshed knowing that others are continuing to work as teacher-musicians. The hardest part of my teaching “career” was the feeling of loneliness, that I was the only one trying to make an impact in this way. It turns out that I couldn’t have been more wrong: these people are doing excellent work, and I hope that efforts like Ms. Nicholson’s continue to connect them to encourage support and innovation for their work. I’ll briefly summarize a few of the interesting topics that came up in the discussion (that I managed to jot down while listening.) Please take any of them and run with them below in the comments! – Porter also emphasized the notion of process-oriented instruction, pointing out that students can “get” even really “out” stuff if they experience it through performance rather than listening. Tom Zlabinger saw it as simply modeling love, teaching through his passion about the music. He pointed out that being in the band; that is, the social aspect of music-making is of utmost importance. – Jessica Jones added that she has seen success and built goodwill at her school by integrating into the school culture: playing in the cafeteria at lunchtime, for example. Levin added that he has managed to build trust with administrators by trying to speak their language: achievement, critical thinking skills, Blume’s Taxonomy, and all that other educator-speak got him in the door with his supervisors. Mrs. Nicholson Parker’s goal for this panel was to plant the seed for a network of creative musicians involved with the teaching profession. If you’re a teacher by day, musician by night, please chime in and add your perspectives on teaching creative music and improvisation in the schools! Educational institutions are having more and more influence over the development of musicians, so this work is incredibly important for the future of the music. I’ll be sharing anything that comes up here with her and the other musicians on the panel — it is my hope that the fruitful discussion started on Sunday can continue here. You’re right, Patrick, that the relationship is somewhat tangential. What I was trying to show is that the festival organizers are choosing this route — fostering a network of educators supporting “the cause” — rather than the one you suggest of pushing the community’s boundaries a bit and/or opening things up to a younger generation of already established players. This approach operates within the framework of the community, as opposed to reaching outside of it and incorporating other voices. I hope that both strategies are employed in future Vision Festivals. Hi Alex – thanks for the mention in the Vision Festival panel info – I think it was a valuable panel too, and I was honored to be included. I’m glad you felt it was useful. I agree that we all do feel isolated, though I know there are many, many successful music programs in New York City schools – and beyond. I appreciate the efforts people, including you, are making to aid in networking among music teachers. The more community and creativity the better. PS How about people sending links of strong/dedicated music programs in the schools in NYC? just a thought. First rate work as usual. I’ll link to it. The difficulty of avant is over rated. Just sit and soak it up. It is about flow. You are probably more avant than you know.